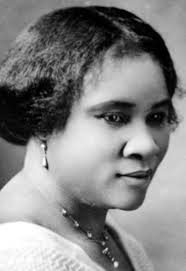 Daughter of slaves from Louisiana, in the second half of the 19th century, Sarah Breedlove (her real name) was orphaned at the age of 7 and soon found herself faced with the adult world: a servant at 10, married at 14, she became a formidable businesswoman a bit by chance. The victim of a scalp disease that made her lose her hair, Madam C.J. Parker (she took the name of her third husband) developed a formula to remedy hair problems and began to commercialise it. Madam C.J. Parker created a complete range of haircare products for black women, which sold throughout the country. She toured, attended conferences, and trained her representatives – such things were almost unheard of at the time. She became the first black millionaire businesswoman. And she decided to use her influence to lobby for the rights of black Americans. In 1998, the United States postal service issued a commemorative stamp to honour Madam C.J. Parker!